Hello and Happy Spring! I know that not everyone has Spring Weather right now. I've noticed a few friends in Wisconsin posting pictures of snow. I am so thankful that it is beginning to feel like Spring here in Middle Tennessee with 70 degree weather most days! If you have already been hoping on this month's OSAT Blog Hop, I would like to thank you for continuing. If you started with me, thank you for stopping by and please make sure you hop all the way through so that you get lots of inspiration! Although I'm beginning to notice lots of beautiful flowers blooming, for me Spring takes me to Spring Break and all things Nautical! I spent many a Spring Break with my children in Florida and my husband and I usually go on a cruise in the Spring so Nautical it is for me! 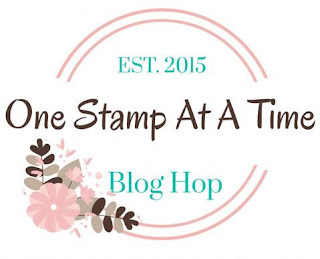 There are soooo many things I love about the Stampin' Up! Tranquil Textures Suite! The DSP is gorgeous... Tranquil Tide and Fresh Fig and so beautiful together! I love the Sea of Textures Bundle! That Octopus is awesome and the coordinating Under the Sea Framelits cut some of the areas between the legs and that seriously makes me happy! Also, the framelits contain a super cool fish net stand along die as well as stand alone seagrass and coral that I used on this card! Thanks so much for stopping by! You are at Tina Riddle's blog so just click the name right below mine on the Blog Roll below to stop by the next blog! What embellishments did you use on your card? They almost look like marbles! I'm ordering this bundle this month. It's always something! But, we love it! They are glass water droplets in blue and green. I believe they were purchased from hero arts but many stores carry them. The back of them is flat so they are easy to adhere with liquid glue. The DSP makes a very pretty water background.